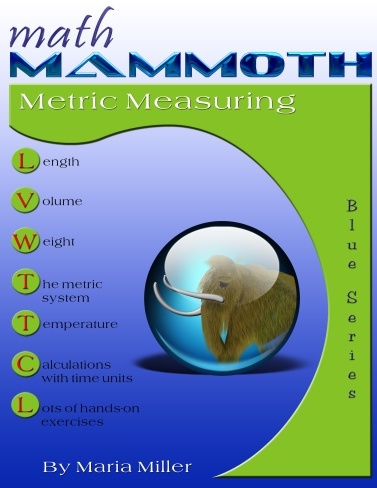 Math Mammoth Metric Measuring - elementary math workbook for grades 1, 2, 3, and 4. Download and print. Math Mammoth Metric Measuring covers measuring related topics over the span of four grades (grades 1-4). The lessons for this book have been compiled from two of my books about measuring, and are presented here as a single book that only deals with metric units. The lessons cover measuring length, weight, and volume, measuring temperature in the Celsius scale, the 24-hour clock and elapsed time, and in general using decimals within the metric system. While the book contains something for all grades from grades 1 to 4, the bulk of the lessons are targeted for second and third grade. This book contains both explanations of the material and exercises, and is thus termed a worktext. It is designed to be very easy to teach from, requiring fairly little teacher preparation; however in several lessons the teacher needs to gather measuring equipment beforehand, such as a ruler, a scale, or measuring cups. This book is not organized by grade-levels nor with increasing difficulty. Instead, the lessons are grouped by topic. The first lessons in each section typically have hands-on exercises where the student uses suitable measuring equipment, and the last lessons in each section include problems about conversion between the units. The very first lessons cover measuring length using centimeters and millimeters. Then we study meters and kilometers. Children use the bathroom scales to weigh objects in kilograms. Other lessons teach grams and estimating weight. The goal is to let students become familiar with kilograms, and have an idea of how many kilograms some common things weigh. The lessons include many hands-on activities so that the student gets first-hand experience in measuring, and has a basic knowledge of how "big" the units milliliter and liter are. One lesson also includes deciliters. In these lessons, students learn how to use decimal numbers within the metric system and the various prefixes. The lessons deal with Celsius degrees, how to read a thermometer, changing temperature, and temperature line graphs. The emphasis is in conversion between various time units, the 24-hour clock, and calculating elapsed time. The lessons do not cover how to read a clock; I have a separate book called Math Mammoth Clock that can be used to teach telling time. When it comes to measuring, experience is the best teacher. We all use various measuring units in our everyday life, and using them is the key to remembering what they are and how to convert from one unit to another. The units your child is not using are likely to be forgotten easily. So encourage the young elementary students to have free “play time” with measuring devices such as scales, measuring cups, measuring tapes, rulers, and thermometers.